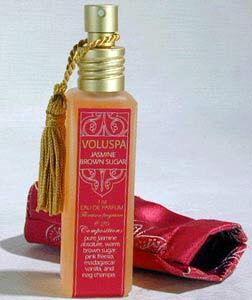 Voluspa parfum in Jasmine Brown Sugar. 1 oz. of the sexiest scents ever! The signature silk slip that the miniature atomizer comes in fits inside perfectly inside a purse. Fragrance: Jasmine Brown Sugar combines pure Jasmine absolute, warm brown sugar, pink Freesia, Madagascar, Vanilla, and Nag Champa. I have Blond Tabac, Coca Tamarind and Jasmine Brown Sugar. Yes I love the fragrances and I mix them together all the time. The scents are there even long after you can't smell it. You really can't afford not to try these - I intend to get all of them! The Jasmine is Spring in a bottle - fresh and not sweet; the Tabac is woodsy green; and If you love grapefruit get the Tamarind. Remember these are very concentrated so don't overdo it. One bottle lasts long time. Just get a couple of them and play!!!! OH LORD YOU ARE GRACIOUS, I FOUND THEM. I am so thrilled, and excited, completely privilege I found this gem... WOWZER VOLUSPA how I love thee. I will never take you for granted again and NEVER will I ever share you. You are so unique and lovely, expensive, filled with quality ingredients that I have stock piled you so my 4 year old daughter can enjoy your beauty in case you are ever discontinued. Please do yourself a favor, buy several of the $18.00 dollars little bottle of parfum. No matter which one you choose (if you are lucky to find them) you wont go wrong, they are all lovely, inexpensive and you will be a fan of this little secret FOREVER. At first the jasmine is overwhelming but as the scent settles on your skin it smells delicious. The Jasmine and Freesia are topnotes but the undertones of Nag Champa, vanilla and brown sugar mellow them out. To me, it smells like the essence of summer in a night garden. The packaging is lovely too! This is my favorite. Could bathe in it. Please never stop making this scent. I was traveling on a tour bus, and every day when I passed this one row, Id pick up the most alluring scent. I finally had to sniff it out and ask what it was! This has become my signature scent. It is rather sweet, but not cloyingly so. It has a sunny, warm, summer day feel. I discovered this fragrance in 2008 at a boutique shop. Guys love it like no other perfume I've ever worn! Every time I wear it (usually on a night out, it's too precious to wear daily), I get compliments left & right of how *good* I smell. Its unique, and easy to carry on travel. Its the only fragrance I haven't gotten sick of. 1 spray is enough, as it's strong and lasts for HOURS. It's sweet and ultra feminine, the jasmine & brown sugar are an amazing blend. It's impossible to find at the stores, and even online it can be a hunt for this particular Voluspa fragrance. Thank goodness for Zanadia! 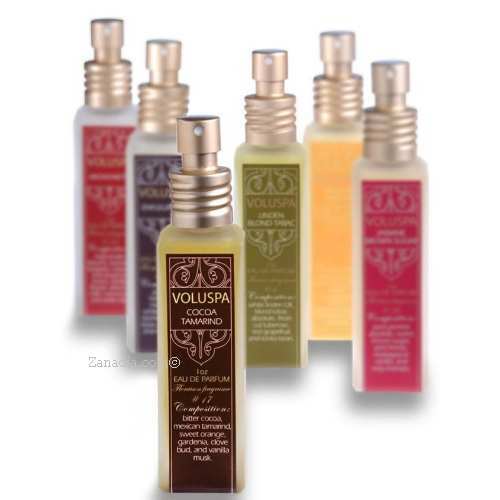 Smells sweet, feminine, and deliciously light:) perfect for spring & summer:) i have 4 other voluspa parfums and enjoy them all. Zanadia is great. A nice, light sweet scent. Have bought this for family members who also love it. Consult the Policies Page for complete details. 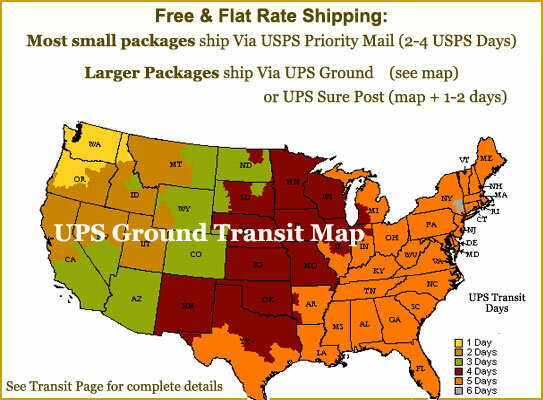 The majority of items on Zanadia.com are returnable within 30 day of receipt. For hygienic and customer safety some perfumes and colognes are shipped in sealed bags. Once the seal is removed these items are not returnable.